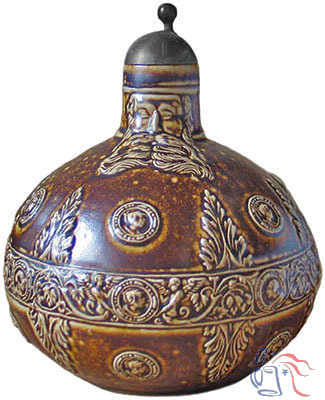 The bearded man jug (Bartmannskrug) is a form dating back to around 1550, featuring the face of a bearded man at the neck representing the mythical woodland Wild Man of Germanic folklore, a symbol of strength and endurance. 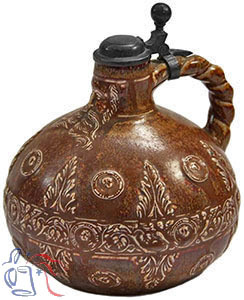 This design was copied from an actual Renaissance period piece, one of some forty-two Renaissance replicas first manufactured by Merkelbach in the early 1900s and reproduced regularly thereafter. These items were numbered 1 through 42, duplicating numbers applied to earlier Merkelbach offerings. Same model number applied to a stein depicting Renaissance Portraits.